With all my energy in the last month going into planning our trip to Italy and some other upcoming getaways, it’s only now hitting me that summer 2018 is just around the corner! Where did May go? Traveling and vacations are always the highlights of summertime for me, but this year I want to do a better of job of making memories at home in New York especially now that we need to start prepping and saving for a wedding. Eeek! Visit an art gallery. I’ve always wanted to do this, but admittedly I’m not very in touch with the art scene. If any of you have recommendations for exhibitions I’d love if you could let me know! Eat fun sweets. I always take a screenshot whenever a delicious-looking local dessert pops up on my Instagram feed. 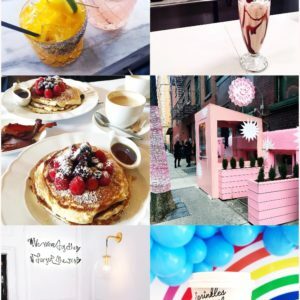 At this point my camera roll is full of ice cream-filled Belgian waffles, churros, cookie dough, cupcakes and donuts that look like art. Now I’m not trying to gorge myself every weekend, but there’s no harm in trying some fun treats here and there. Indulge in rooftop drinks. Where New York lacks in grassy spaces and outdoor eateries, it makes up for it with rooftop bars. It’s always fun to have drinks with a view and I hope to try a new rooftop bar or two this summer. Go to a food festival or pop up eatery. I feel like I walk by food truck pop-ups and street food festivals all the time, but I never actually stop at them. 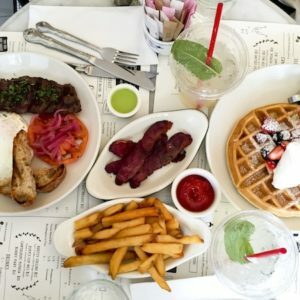 There are always a ton that happen in the summer here, so I want to research ahead of time and maybe have a date night with Nick or do a food crawl one afternoon! Check out all the colorful street art and murals downtown. Similar to the rotating door of new restaurants and bars in New York, there’s a constant turnover in street art and colorful wall murals. You’ll see the entire side of a building covered in rainbow hearts one week and then the following it will be painted over with something brand new. It would be fun to spend an afternoon walking around Soho, Nolita and the Lower East Side just seeing what I could find. Visit Coney Island. I’ve always wanted to visit Coney Island, but for some reason we’ve just never made it out there. I’d love to walk the boardwalk, eat some yummy fried food and explore the beach at some point this summer. What’s on your summer bucket list? Anything else you think I should add to mine? Hey Katie, love this list! Trying new bars/food spots I’ve had screenshots of saved on my phone forever is definitely on my list this summer too lol. And take it from someone born and raised in Brooklyn, if you wanna come to Coney Island its gotta be on a Friday night! The beach honestly isn’t great and its always crowded, but Friday night fireworks in Coney Island are an absolute staple in the summer. There’s nothing like hanging out on the boardwalk on a warm night eating carnival food and watching the fireworks (every Friday night at like 9:30, starting 6/22) with people you love. And maybe hitting up mini golf, or some of the bars or arcades or rides after. So much fun! Such a fun list! I haven’t been to New York in a long time, but I’ve always wanted to try to walk the Brooklyn Bridge! I also have been dying to check out more murals throughout Chicago, because there’s so many! I’m heading to NYC for the first time next week and I have a question about shoes. I noticed you wearing your TB Miller sandals. I wear mine a lot where I live in CA, but everyone has told me that I’d regret taking them because they’ll get so dirty walking around the streets of New York. What’s your opinion? And….how hot and humid is it right now? Ah! I am a born and raised New Yorker and I have never walked the Brooklyn Bridge!! I want to so badly, and it’s on my summer to-do list also!! I also want to go to Smorgasbord in Brooklyn!! I would also like to visit Coney Island and The Museum of Ice Cream too! Thanks to you, we have already decided on the plans for the weekend. I just recently visited New York and loved it! Sadly, I didn’t get to walk to Brooklyn Bridge this time, but I hope if I have another trip I will. The Museum of Ice Cream sounds so cool! I also visit New York .It is really beautiful city.. Thanks for sharing your NYC bucket list! I’m going to New York next month to catch a cruise. I don’t have much time in the city before we head out to see but I wanted to see as much as I could. I thought my day would be really expensive but seeing your list made me realize I can find a lot of things to do without spending too much! Thanks again. 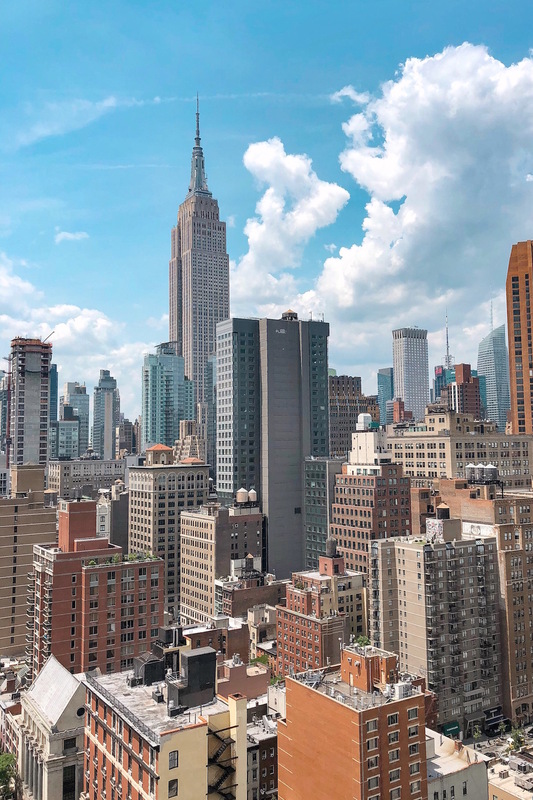 I just love the way everyone has a different bucket list because there are literally so many things to do in NYC, that one person probably couldn’t do everything in a lifetime! When we were there I loved walking through central park to Strawberry Fields, Visiting the Met and the Natural History Museum and walking the Brooklyn Bridge. So much to do, so little time!